Olympos is beautifully drawn and has an intriguing concept, but fails in execution. Ganymede was stolen from his home by Apollo and trapped in a miniature garden with no escape in sight. He longs for freedom, but has given up on it by the time the reader picks up the manga. The beginning with Heinz is fun and entertaining, however, shortly after his departure the story falls apart. There is no plot woven throughout the story and it has flat characters. The story shifts partway through to Apollo's point of view, but for no rhyme or reason other than to add depth to a character. This depth has no influence on the events that follow. There are possible plots that are mentioned offhandedly and never come to fruition. (view spoiler)[In fact, the readers are told by the characters themselves that everything they do to destroy the world adds up to nothing. (hide spoiler)]The characters lack life and/or are unlikable. Ganymede quickly becomes a bore, and although Apollo has an interesting back story there is nothing likable or sympathetic about him. Hades and Zeus are interesting in concept, but like the story itself, they are not executed well. Hades is inactive and only comes in to be cryptic, while Zeus is more mentioned than seen (which could have worked if there was a stronger cast of characters). (view spoiler)[Also, nothing changes. Ganymede becomes a bit more content with his situation, but that's it. Apollo is the same, Ganymede is in the garden, Hades is being cryptic, and Zeus watches over everyone. What is the point in reading a story if nothing changes/happens? (hide spoiler)]All I can say is, unless you're a reader that takes delight in watching inactive characters brood, or youreally love philosophy, this is probably not the manga for you. Numerous people have given this manga a low rating due to their lack of connection with the plot, but in all reality it is a very deep and layered plot with numerous complications that take a few reads before one begins to understand.The story is a loose adaptation of the Greek mythological tale of Zeus and the beautiful young Ganymede. With stunningly gorgeous artwork, Olympos dives into deep philosophical concepts in aesthetic brilliance.The first section begins with the radiantly beautiful solar deity, Apollo, rapturing the human Heinz, an aspiring archaeologist, into a landscape which consists of an idealized, but ruined building of ancient Greek architectural emphasis surrounded by an endless plain of flowers. Inhabiting this surreal scene is stunning Prince Ganymede. Apollo asserts that all words spoken by a god are true, and tells Heinz to help free Ganymede, who is supposedly trapped by his own delusions of the world around him. The plot reveals, however, that Ganymede has tried to escape the prison landscape for years, and Heinz just adds to the injury. The thought provoking thing is, however, that Heinz found a way out of the landscape, whereas Ganymede did not. So, was Ganymede really trapped by his own mind, or was Apollos lying? Heinz is based off of the real life archaeologist, Heinrich Schliemann, who discovered the city of Troy, where Ganymede was abducted from. It is shown that Zeus used Apollo to abduct Ganymede for their own personal enjoyment. Eternity is a very long time, and humanity gets boring after a while. Ganymede provided a thrill for the gods, at his own expense, separating him from his family and making him endure the boredom of eternity alone. The most interesting character to me, however, is Hades. Hades is a mysterious character who gives cryptic messages that, if only read once, would confuse the reader. But given the context of the book and re-reading and evaluating certain scenes, the cryptic messages of Hades' become clearer and a deeper meaning is unraveled. Those who gave this book a low rating are probably not apt to deep thinking or literary analysis, hence their misunderstanding of the book. What would be described as "flat" characters are actually round characters in a flat presentation; their roundness is dependent on how well one reads into the story. The reason I bought this book at first was because I was so drawn to the artwork. Honestly, with the artistic quality, I wouldn't have cared if there were a story. However, I enjoyed the plot. It's more reflective philosophy than anything. If one expected a moving, dynamic plot, they will be disappointed. I don't think that all stories must have excitement, or twists in stories. This one was simply filled with contemplation, and beautiful characters. This is just my preference, but I love philosophy. This manga basically ensnared profound ideas and reflected over them through the movements of the characters. I was entranced by the ideas that the author presented, and I fell in love with the way the characters moved and thought.If you need ideas to chew on, buy this manga. Trust me, you'll need time to appreciate it though. Hmmm...I don't remember the last time I read a manga that had such beautiful artwork but was paired with what felt like such a "plotless" story. Although no, that's not quite the case. The plot is rather simple: Ganymede wants to get out of the garden Apollo has put him in (for whatever reason), and we're originally introduced to Heinz and mislead to think that he's the main character (although he isn't, and only sticks around for volume one as the second one isn't related to him at all and we never even find out what really happens to Heinz in the end). There's Artemis, who magically pops up out of no where are for some reason keeps sitting under a tree. There's Zeus, who for some reason makes an appearance in Apollo's garden in front of Ganymede yet never says a word, vanishing as fast as he appeared. For some reason some of the Greek gods exist and others don't - Apollo for example says that the goddesses Athena and Iris don't exist when the mortal girl Iris brings them up in a list of Greek deities that they worship, and the reader never finds out why they don't exist while gods like Apollo and Artemis are "perfectly legitimate". There were some interesting points, for example how the gods don't care about protecting humans. Hades was the only character I actually liked, mostly due to his Chesire Cat-like cryptic personality with his never-ending spew of riddles and dark thoughts. Other than that this book felt a little too much like a slap-dash plot that had to accompany some pretty artwork. The author's note after the epilogue ticked me off, to be honest. The fact that the mangaka asks the reader to sort of go along with her work just because she drew/made what she felt like making doesn't merit much respect from me as a reader. I agree, the art is very pretty in these two volumes, but the plot is so thin and has to be twisted and played with to a large extent in order to sort of justify it's own existence. I feel like this is one of those mangakas who expects their work to be admired and accepted for what it is without being able to handle criticism, which in this case is the follows:beautiful art, but very very very watered down, microscopic plot that had a lot of potential with some of the interesting thoughts being thrown out that sadly went no where.If you're in the mood for eye candy, pick this one up. But I personally don't care much when a writer has such a slap-dash approach to their work, and on top of that tries to justify it and make the readers swallow that, "just because". I am very annoyed and disappointed that the narrative of Olympos wrote out all of the Greek goddesses except for Artemis, who unfortunately isn't really a character, but a mirror for Apollo. Which would make sense as one of her aspects, but not the only one. I liked how Aki did all of the Olympians and handled the story of Ganymede. The re-imagining of Zeus is quite awesome, and the reworking of Hades is more than worth the price of admission. It's because the revisioning of the Greek gods is so cool that I wanted to see ALL of the Olympians. I understand why the mangaka didn't populate Olympos with more than a few gods (crowding the work with characters would have detracted from the isolation of the story as well as its philosophical and emotional underpinnings). HOWEVER, not seeing ANY of the goddesses does make me sadface. On the whole, thought this reworking, well, works and is quite entertaining. Ok a lot of people have given this book a poor rating and I can understand why. This isn't a book for everyone but I loved it. It was beautifully written and the art work was stunning. But here's where most people have a problem with it, nothing happens. There's seemingly no plot but that's kinda the point. The whole premise of the book is that nothing really happens and that's why the gods are bored. But the beauty of this book lies within its characters and the questions they ask about themselves and the world around them. To me this book was beautiful and haunting. It will always be one of my favorites. For me as a reader, it was hard to get too involved with the characters since it's in the point of view of Gods. The dialogue also put me to sleep, since it was SO formal the entire book. And since it was in the point of the Gods, and they only speak in riddles, the entire time you are just trying to figure out what they're saying to each other through their formal riddles. Sometimes I had a good laugh about it. And I was really surprised to find a manga with so much philosophy in it. I really enjoyed it. Was so completely different from the other mangas I've read so far. Also the drawing is beautiful and very rich in detail. Great work! Ganymede has been trapped in a miniature garden for who knows how long, before Apollo decides to spice things up and drops Heinz, an archeologist excavating Troy, into the garden. Heinz's presence amounts to nothing but a blip in Ganymede's eternal boredom. Over the aeons, he discusses the meaning of life and how to escape the garden with Apollo, Poseidon, Hades, and even Zeus.The artwork is so, so lovely. That being said, this book seemed like a whole lot of nothing? I could barely follow the conversations. There was no real dramatic conflict (especially not after Heinz left...). Just a bunch of gods talking about how they can't lie, so when they tell Ganymede that he can't escape it's the absolute truth. Then what's the point of Ganymede being trapped there for all eternity? Unlike in most of the mythologies I've read, these gods seem to be rather isolated, and have never contemplated their own existence, never tested the rules. There are really only a handful of them (Apollo here claims the rest are made up) - Artemis is the only other god other the ones I mentioned above, and she's more of a mirror to Apollo so who knows if she really exists. It's interesting in a philosophical way, but as a story it doesn't really go anywhere. I confess myself a little baffled by this book. It seemed like the author was intending for there to be a plot of some kind, but multiple events that could have spawned one just sort of got dropped. In the beginning, there was some hint of the characters having personalities, but they never progressed past flat and one-sided. The entire story consisted of endless, random dialogue of Ganymede being angsty and angry, Apollo being obnoxious, Hades being pointlessly cryptic, and every now and again, Zeus making a dramatic, silent appearance and disappearing again. You could make the argument that it was supposed to be philosophical, not action-packed. I have no real reply to that. There were a couple of interesting concepts introduced, such as the audacity of humans believing that the gods share their needs, and the Lady Artemis as a mirror, but on the whole, it fell far short of that. Maybe the translation was at fault. It was so awkward and verbose as to the transform all dialog into beautiful nonsense. The one real redeeming factor this manga brought to the table was the artwork. I find it ironic that this is what the artist chose to be self-conscious about in the artist's notes in the back. Plus, it was really annoying getting whacked in the face every other page with "the gods cannot speak an untruth." Thank you for clarifying that they can speak something that's true even if they didn't know it was true. That was helpful. The first six times. It was very pretty, though. The art style reminds me of Yun Kouga's Earthian, which is what drew me to the manga in the first place. Shane it turned out to be so..... empty. First time I've ever regretted spending two dollars in the Blue Dragon. Not much a reviewer but I wanted to try and get my thoughts out about the book. There will be spoilers in my thoughts/review of the book. Beautiful artwork, just the art alone is enough to possess this book if you are a collector of manga, graphic novels, or art. The color pages are amazing and and inked pages are full of scenes worthy of framing on their own. If you are looking for a book about the Greek Gods and their mythology this will most likely disappoint you. Only 4 1/2 of the Greek Gods are present in this story. Artemis does not/ can not exist with out Apollo. This is definitely not a story for a feminist but it isn't necessarily anti women either. It is philosophical in a way that is reminiscent to philosophical works of the time. Thinking just to think, even if the thoughts you have can not change anything, they must still be thought. You can't resist the trap. It's not a bad book. I think I purchased it expecting something about the mythology I already know but this is a story all on its own. You need to read the book with out expectations of what it should be. I finished it thinking it was only 3 stars but I think it deserves more than that. If it was meant to make me lost in thought about what it was saying then it more than succeeded. I want to read it again and again in hopes of a higher understanding. In the end I think it is a very successful story that will leave you lost in thought about what it is and what it is not, even if the author never meant for that to the outcome. Gorgeous, stunning art and a wonderful cast of characters make this story of Greek gods and the mortals they watch for entertainment, published in a top-notch omnibus edition by Yen Press (with full color inserts, unf!) that is certainly worth the admission price. Don't be misled by the summary; it's more Apollo's story than Ganymede's, although Ganymede is a huge player in the overall story. I think my favorite character is Hades; I didn't expect the lord of the underworld to be so, well, hot. I can only hope there's more of Aki's works available in English soon; her artwork alone is enough to earn a permanent place on my favorites shelf. More so a philosophy 101 course than a boys's love manga, Olympos is very unique. In a way it could be a historical story about Ancient Greek myth, but that would be a misnomer. Olympos is more like an examination of the extent and limitations of its own cosmology, and by extensions our own. Oh, and Apollo and Ganymede are delightful together. The art in this is so pretty I have urges to stab my own hand because it cannot produce things of equal beauty. Pretty. Vaguely interesting but ultimately boring and unsatisfying. A relatively interesting manga featuring Apollo, the sun god, along with some others (such as Poseidon, Zeus, Hades, and Artemis). Apollo has taken a young boy from Troy and keeps him in a special garden belonging to Zeus. The boy, Ganymede, can never escape the garden, even through death. At the beginning of the manga, a young archaeologist makes an appearance, but is not in the rest of the manga, which seems like a wasted character. At some point, Apollo visits a temple where people have crafted a statue in his image (although it looks nothing like him). When conversing with a girl that is meant to be a sacrifice, Apollo learns what people really do and expect from the gods, something he was not really very aware of. While the art in this two-volume omnibus is very stunning, the plot is rather lacking. There are characters that have the reader questioning why they are even used at all, and there's not anything linear to the story, for the most part. There are various tangent plot lines that do not seem to match the initial story. While the art is stunning, the plot could have been developed further. The most interesting plot line is when Apollo converses with a girl who is meant to be a sacrifice to him. If the plot were more about the gods and their interactions (or lack thereof) with humans, it would have been more interesting. Overall, worth a one-time read but not something I need to keep or read again. The art was stunning, but the plot devolved into a debate on the superiority and limitations of gods. It was a bit too cerebral to keep me interested, and I was sorry when the original plot (the amateur archeology hunter) completely disappeared from the storyline. Also, every female character is portrayed as alternately a) adoring, b) dumb, c) petty, or d) literally existing only as a mirror to a male character. So yeah. That didn't do much for me at all. But it's pretty to look at. The art is lovely, but the logic behind the characters and story is a bit hard to follow. I liked Aki's portrayal of Apollo as a sort of self-centered, but curious, entity, and the humor doesn't seem out of place when it comes up. The omnibus edition includes some pretty full color spreads on glossy pages that I would love to have reproduced as posters. Overall, an interesting alternative take on Greek mythology and musing on the attitudes of God's in general. The art is so freaking beautiful. You may have to reread the book several times to grasp the true story. The big problem that keeps this book from being successful is the lack of development in the story throughout the entire journey and the jumps between who are the real main character, as well as the haziness of the actual point of the book. 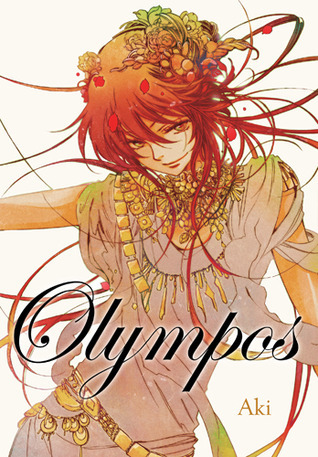 Olympos by Aki is a tale about Ganymede, the prince of Troy, and what the author presents as what really happened to him. The myth of Ganymede says that Zeus took him as a baby away from his home in Troy due to his magnificent beauty, and in the sky, the boy serves as Zeus’s personal water boy and in some cases, his lover. Olympos is about Ganymede’s life in the “Miniature Garden,” and his life with the immortals that surround him, the main one being Apollo, and his struggle with what he must now endure in the small cage in which he is trapped, unable to die or age. The story is also, however, about Apollo, god of the sun, and his experience dealing with mortals and his attempt to understand certain human thoughts.Ganymede is kept in the Miniature Garden though the entire book, except for the flashback of when he lived in Troy before Apollo took him. Ganymede’s kidnapping from his home is the only real thing we know about him, outside of his position as prince and that he has a brother who may or may not have really died. His character stands still throughout the entire book, never seeming to change form the ignorant mortal caught up in the game of the gods without desire to be there in his immortal state. Apollo is another main character, the author taking his part of the story as an “all gods have too much time on their hands and know nothing of who they really are or where they came from and are just as confused as you and find mortals very tedious” approach. Apollo goes through two supporting characters while the reader learns nothing besides what I just mentioned about his views on humans and his confusion about his existence. At the end of this relatively voluminous manga, we still don’t know the deeper reason that Apollo took Ganymede, or what he expected of him while inside the Garden. Another character who causes mayhem in the plot of this story is Hades. The god of the underworld offers little but confusing philosophical nonsense in his conversations with Apollo and Ganymede about the apparent “milestones” in the characters’ developments. I find that while he was an intriguing character to read, he offered little to nothing in an already dizzy-spinning plot without an evident purpose. In my own opinion, this book is best recommended for a reader who is more interested in pretty art, who doesn’t care about accurate mythology for the sake of a story, and who enjoys being tossed around while reading from complex idea to complex idea. Olympos, while juvenile in the development of many aspects that would make it a better read, mainly character and plot development, it was interesting and kept my interest until the end of the last page. Check out more manga reviews on Across the LitoverseDesperate to win his lover's hand in marriage, a young man named Heinz appeals to the gods—of course, he hadn't planned to be taken captive, mid-prayer, by a beautiful, fiery god…Apollo, the god of the sun, spirits Heinz away to a miniature garden hidden in the realm of the Gods. Here, the constellations remain fixed, and an endless field of white flowers bloom underfoot. Time cannot be measured in this place, and eternal life will be given to all who enter. Apollo promises to grant Heinz his wish on one condition: Heinz must convince the garden's sole inhabitant that he can escape from this world. A simple premise, but the gods are a fickle lot…From there, Heinz meets Ganymede, the youngest prince of Troy, who was imprisoned in Apollo's garden hundreds of years ago. After repeated attempts to find the cliff at the end of this realm, Ganymede succumbed to his own self-doubt and despair. Heinz is young by comparison, and he's still blinded by ambition, love, and, worst of all, hope. Can Ganymede free himself from the snares in his mind? Is escape even possible at this point? Or is this a new torment fine-tuned for Apollo's amusement?Oh, the artwork of Olympos. The ethereal qualities of the ill-fated garden, and the detail behind the gods' character designs, made for a stunning reading experience. I don't often get lost in the art of a manga collection, but Aki creates such beautiful, hypnotic dreamscapes—how could a reader ever avoid the same traps Ganymede fell into? While I did love the artwork, I found the narrative was rather circular at times. Olympos offers a "philosophical-lite" approach to Greek mythology, and tussles with issues ranging from truth and deception to self-imprisonment and the limits of freedom; however, I realized the manga fell into a pattern of talking heads (à la Socrates and co.) with little action taking place. Granted, our main setting is Ganymede's infinite prison, so there's only so much room to explore—but I often find idea-driven work hard to stick with, especially when the characters are gorgeous and, well, lounging for the most part.Overall, I'd advise fans of Greek mythology and Western philosophers to proceed with caution, but art aficionados should definitely check out Olympos for a drool-worthy manga experience.Ideal for: Josei fans feeling underrepresented in the manga marketplace; North American readers who need a lesson on the artistry inherent to manga; Folks with a weaker background in Greek mythology and philosophy, and a strong interest in gorgeous character designs. Olympos is about a beautiful prince named Ganymede who is taken away from his family and kingdom by the god Apollo. Ganymede is given immortality and gets trapped in a garden where gods watch him and entertain themselves by seeing Ganymede foolish act of trying to escape. Over time, Ganymede discovers how gods are forced to live long lives, leaving them with nothing to do but play with humans; making them bring sacrifices and offerings, sometimes even showing their faces to make humans think they have either done something good or bad. The main character Ganymede learns about is Apollo, his capturer. Apollo likes humans because they are different and have a strange ways of living their lives, but the closer he gets to humans, the further away he moves from other gods, which could mean hardship, but gods have long lives; there is no reason for anger due to lack of communication.I liked this book because it gave great insight into what human lives could look like to gods. For example, Apollo gets a woman sacrifice, whom he befriends, but then she is killed, in hopes she will join him in the afterlife, but of course, she does not.The biggest thing I did not like was how random characters were kept being thrown at the reader with little or no significance to the story. For example, the book itself starts off with a boy praying, and Apollo agrees to make his wish come true, but turns out, the kid is not even the main character. This throws everything off balance because now I have to overpredict of how the book might end. ~3.5/5[Read more at my blog, Geeky Reading! ]I mainly only picked this up because it’s just so pretty. The art is gorgeous, and there are these pretty colors pages, and it’s a nice big, one-volume edition. It just looks to nice and feels so nice in my hands. The story was not quite as good as I was hoping it would be, but it’s still so pretty.I don’t know how accurate the story was to actual mythology (although I don’t think very, given the little blurb at the back of the first volume), but that isn’t too important to me. I don’t mind an author taking well-known characters and taking a different path with them. That isn’t to say that I would mind a remake of an old mythology story, though, because that would have been nice, too.I enjoyed the stories in this book, and I felt for Ganymede several times, because the poor guy has been put in such a bad spot. The Gods are rather horrible to him. Apollo in particular, who I was rather interested in how his story progressed. The ending was rather open, not much of a conclusion, which bothers me a little.It bothers me that several of the male characters look like girls. I did find the look of several of the Gods really intriguing, and liked what Aki did with them. As I’ve said, though, the art was really pretty. Overall this was a pretty good read. It was intriguing, short, not particularly intense or with a lot of character depth, but thoughtful and sweet. I enjoyed it, and am glad that I picked it up. Okay. Before I get into reviewing the actual story, I need to acknowledge the stunning artwork. Everything and everyone is so detailed and beautiful(Especially Apollo, my fave greek deity) The plot isn't really shonen/shojo, but more of a philosophical "why do we exist" plot. It was essentially about what an immortal deity would do on its free time, when it has so much of it. It also talked about how people create their own myths to explain what logic cannot. It was very interesting to hear what each character's opinion, and the dialogue was excellent. Did I already mention the character designs??? Flawless. Hades....looked...like a goat... Poseidon had bubble hair.... Zeus was covered in eagle feathers.... Artemis, however, I disliked because she existed solely for Apollos image, and( even though Aki stated that they were not incorporating the myths into their storyline) was so different from the Olympian Artemis whom I love. The Rest of the Gods had similar personalities to the myths; it was interesting to see Apollo interact with mortals,All in all, I really liked this book. I'm giving 3 stars because I love the art too much, but the plot and its execution is not as good as the art (just 1 star for that).The story really doesn't have much relation with actual Greek Mythology or Ancient Greek culture anyway. It even became annoying to some point, like page 200 where Apollo complains on the statue made by mortals to be ugly (come on, Ancient Greek bronzes and sculptures were amazing) and he even adds "that's why they believe all the gods look macho!! ", quote that makes no sense because Apollo was never portrayed as "macho" man in Ancient Greece, he was actually the type for beautiful young man (again look at the real sculptures of him). So I'm not sure of why the author picked Ancient Greece to mock about it and not even keep its beautiful aesthetics. I've seen other mangas where indian or arabic culture elements are taken and made "exotic" but it feels more like some kind of hyper appreciation from japanese perspective; in this comic feels like a joke and not an appreciation of Ancient Greek culture and it bothered me a bit.But well, since I bought it for the art I don't regret it. I have read this manga multiple times and each time I fall in love again. Something fun to know is Aki studied Greek mythology to write this and decided to take her own twist on the gods. Everyone says the art is wonderful but the story is bland. Incorrect. If you enjoy fun and clever philosophical thinking, something that's going to spark your creativity, and teasing this book is good for you. The gods will send you mind on a trip, especially Hades. It's not all together complex theories but they're different and interesting and make you want to know more.Ganymede is a slightly flat character but only because he's predictable and that can make his scenes a little boring but his part in the story is what all things revolve around. Apollo almost seems like the main character at times, and he gives us a lot to think about. You can really see where Aki had fun, making the sun god so brazen. Apollo's relationship with Airtimis/his reflection was something I never considered and it's one of my favorite things to read through again.Lastly, the art is lovely. I can't say enough about how much I love the depiction of Ganyemede.